In a study that Yona Rubinstein of the London School of Economics and I did several yeears ago, we calculated such measures for the years 1965 to 2000. 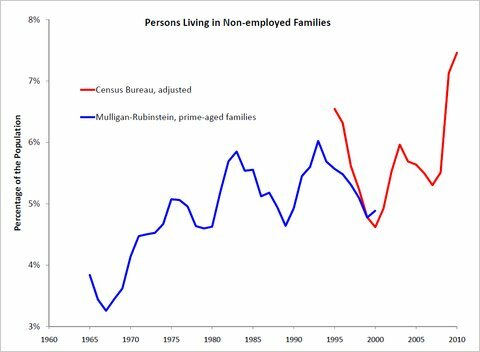 We focused on prime-age families -– that is, families headed by an adult (or adults) 25 to 54 and therefore not expected to be in school or retired (two activities that interfere with working). On average, all but 5 percent of people lived in a family with at least one person working (this includes one-person families). By comparison, almost 20 percent of prime-age adults were not employed. Today I wrote that Allied efforts in Libya are unlikely to bring democracy. Regime challengers are twice encouraged in Iraq – once by the expected future value of leadership and a second time by political freedoms. Perhaps attempts to grab power in Iraq would have been less intense if the country’s oil assets had not gained so much value since 2003, or entry into the Iraqi political process were as difficult as in neighboring nondemocratic countries. Even as the United States and its allies press their military campaign against forces loyal to the longtime dictator Muammar el-Qaddafi, economic indicators suggest that helping Libyan rebels will neither reduce oppression nor result in democracy for Libya. Libya’s oil reserves are among the largest and most valuable in the world, and that alone is a big obstacle to democracy. Leaders of oil-rich countries almost always enjoy rich economic rewards, and there’s an endless supply of factions that would, no doubt, like to have those rewards for themselves. So even if rebel forces succeed under the banner of an essentially democratic revolution in overthrowing Col. Muammar el-Qaddafi, and regardless of whether Libya’s next leader arises from a democracy movement, at some point he is likely to consider political oppression as a survival strategy that helps hold back all his competitors. For this and other reasons, research in economics and political science has found that democracy’s advances are few in oil-rich countries. Prof. Robert Barro of Harvard found that countries with relatively large net oil exports were less likely to have a democratic national government. Prof. Michael Ross of the University of California, Los Angeles, also found that effect. Citizens of rich countries like democracy and like to use a lot of energy, so they generally import a lot of oil. The Barro and Ross results are sometimes questioned on the basis that oil exports are a symptom rather than a cause of a country’s political and economic situation. This is one reason that Prof. Kevin Tsui of Clemson (my former student at the University of Chicago) examined oil reserves rather than net oil exports in a study published in The Economic Journal. He found that democratization –- the process of moving to fair elections, allowing free speech, free political expression and so on -– was much less likely to occur after a country discovered significant oil reserves, regardless of how much oil the country chose to export. Libya has other characteristics that make democracy unlikely. It is more Muslim that the average country in the world and more ethnically heterogeneous, and Professor Tsui has found both of these conditions to be associated with less democracy. If Libya’s rebels are successful, no amount of Allied help will change the country’s location or its basic economics. Nor would it change Libya’s demographics, though perhaps a post-Qaddafi Libya would consist of multiple countries, each more homogeneous than the unified Libya was. The Allied intervention will not bring Libya peace in the short term, and will not bring democracy in the long term as long as Libya has valuable oil in the ground. Real estate’s future can often be understood by closely watching the supply of residential and commercial buildings. In early 2009, employment and gross domestic product were dropping sharply, and real estate values had plummeted from their highs in 2006. The housing market was already in crisis, so it felt right to expect the commercial real estate market to follow. And journalists frequently referred to a looming commercial real estate crisis. But none of this commentary noted how the supply situation in commercial real estate was drastically different than it was in housing. By 2008, it was clear that too many homes were built for the market to bear. But the four-to-five-year boom in housing construction had taken resources away from commercial building, holding down the inventory of structures that would be available for business use. With commercial structures in relatively short supply, I concluded in early 2009 that there would probably not be a commercial real estate crisis creating waves of bank failures. My conclusion was greeted with much skepticism (one example was Salon’s article on “The NYT’s Chicago Economist: Wrong Again,” insisting that warning of a commercial real estate meltdown was part of “reliable economy-watching”). Paul Krugman also weighed in. More than two years have passed, and we no longer hear much about the once-imminent crisis. Professor Roubini still thinks that a commercial real estate crisis is ahead. Others said the crisis was averted. Either way, it is now recognized that the relatively low supply of commercial real estate made a big difference. In order to assess the likelihood that the housing sector double dips – that is, has another crisis something like the one in 2008 – it helps to look at the supply. The black line in the chart below shows an index of housing inventory per person at the end of each year from 1990 to 2011 (with housing inventory measured as square footage, adjusted for quality; 2011 is a forecast). Housing supply almost always increases faster than population, but the housing boom of 2002-6 stood out compared with the other years in terms of the relative rate of housing construction. 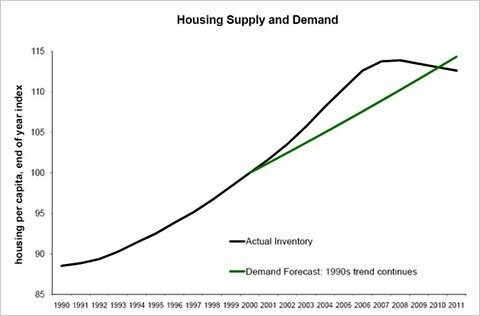 By 2007, housing supply was well above the trend of the 1990s (before the housing boom). If you think that a rational market would have more or less followed that 1990s trend, then the excess supply in 2007 meant that housing prices had to come down. Of course, housing prices did come down a lot in 2007 and 2008, and the housing supply stopped growing. By the end of 2010 – the second-to-last observation shown in the chart – housing supply had fully returned to the trend of the 1990s. Because the pace of housing construction continues to be slow, it looks as if housing supply will be significantly below trend by the end of this year. These supply results tell us something about the future of housing prices. Those prices depend on demand, too, but as long as housing demand is near or above the preboom trend, it looks as though housing prices are low enough already. Part of the inventories of housing and commercial property sit vacant, but those vacancies are largely part of a slow economic recovery and the difficult task of dividing property losses from previous years among homeowners, landlords, banks and commercial tenants. With the slow pace of new construction, neither the housing nor commercial real estate markets can any longer be characterized as having supply that significantly exceeds the fundamentals of demand. Why the Big Deal About Consumer Spending? Economic commentary makes a big deal out of consumer spending, but with little explanation. The many facets of consumer spending are confusing, and public policy often ends up treating the symptoms rather than curing the disease. Both Republican and Democrat politicians tout their economic policies as ways to put money in the hands of consumers. Unemployment insurance, for example, helps people who are unemployed, of course, but it is also purported to benefit employed people because the unemployment benefits received are spent elsewhere in the economy. Much of the debate about President Bush’s 2008 tax rebate centered on whether taxpayers would spend it, rather than invest or save it. But a person receiving money from the government has to do something with the it. And policymakers like to tout investment as healthy for the economy, too. So isn’t investment just as good as spending? Don’t we admire the thrifty more than the spendthrifty?In order to answer these questions, we need to know whether consumer spending has a causal influence on the wider economy – as politicians often suggest – or whether it is a barometer of economic efficiency. Journalists and commentators often note that consumer spending is more than 80 percent of private-sector spending and more than two-thirds of all spending. Thus, at first glance, it would seem that inducing a person to spend would have a larger impact on gross domestic product than inducing that person to invest. However, the size of the consumption sector is not evidence of its potency, because any one dollar is necessarily a smaller share of consumer spending than it would be as a share of investment. One dollar either has a larger effect on the smaller investment sector or a smaller effect on the larger consumption sector – the effect on the total economy could well be the same by either route. Regardless of whether consumer spending stimulates the wider economy, economists generally agree that it is an excellent barometer of the economy. Soviet-style economies sometimes achieved high levels of production but could never be considered successful without permitting high levels of consumer spending. Consumers tend to spend more when they expect their futures to be successful and tend to tighten their belts when bad times are on the horizon. Consumers vary in terms of where they live, their occupations, their expectations and their spending patterns. Aggregate consumer spending is a kind of referendum among many different people, and we can tell from the changes in the aggregate whether spending increases outweighed spending decreases. In this view, a consumer spending drop is a symptom of problems ahead, even if it does not contribute further to the disease. The distribution of wealth and saving is even more unequal than the distribution of consumer spending; more people are consumers than are investors. For politicians seeking voting majorities, this alone may be a reason why they want to see more money in the hands of consumers rather than in the hands of the relatively small group of investors. But this does not mean that consumer spending stimulates the economy, just that it stimulus incumbents’ re-election. Nevertheless, Keynesian economists continue to insist that consumer spending is more than a barometer of the economy — that consumer spending is a driver of the economy, and that right now it is a problem for our country every time a person shifts spending away from consumer goods and toward saving. Regardless of whether Keynesians are correct, they often do not explain themselves. In a way, they agree with me that consumer spending is not the root cause of recessions, because they believe that the real problem is deflation – the tendency for wages, the prices of consumer goods and the prices of investment goods to fall rather than rise – and that deflation is the result of consumers’ belt-tightening. In the Keynesian view, large sectors of the economy accidentally fail to keep pace with deflation, so wages and prices there end up being too high, compared with wages and prices elsewhere in the economy (or compared with wages and prices expected in the future). The sectors with sticky prices have trouble selling their goods (customers view the goods as too expensive) and workers in sectors with sticky wages have trouble finding a job (potential employers view the workers as too expensive). Wages and prices are measured in units of money – how many dollar bills or debits to one’s checking account it takes to buy something. So deflation is equivalently a rise in the relative value of money, checking accounts and other liquid guaranteed financial assets (hereafter, I refer to the three as money). Assuming that deflation is the root problem, Keynesians emphasize consumer spending because they assume that a consumer who doesn’t spend is a consumer who tries to add to her or his holdings of money. With more demand for money, money becomes more valuable and nonfinancial goods and services become less valuable – deflation. Conversely, when a person is willing to part with her or his money to purchase consumer goods, that reduces the value of money and raises the value of the consumer goods – inflation. That’s why Keynesians like it when (during a recession) the government borrows money from investors to, say, give funds to the unemployed. They assume that the investors would have held on to money if they had not lent it to the government, and they assume that the unemployed will not hold on to the money they receive in the form of unemployment insurance. Putting aside the fact that redistribution from investors to the unemployed is a rather indirect means of reducing the relative value of money (that is, creating inflation), Keynesians have assumed, rather than proved, that investors finance their lending to the government out of their money holdings rather than by reducing their purchases of investment goods. If it were even partly the latter, then the borrow-to-finance-unemployment-benefits policy could itself create deflation as it puts downward pressure on the prices of investment goods. 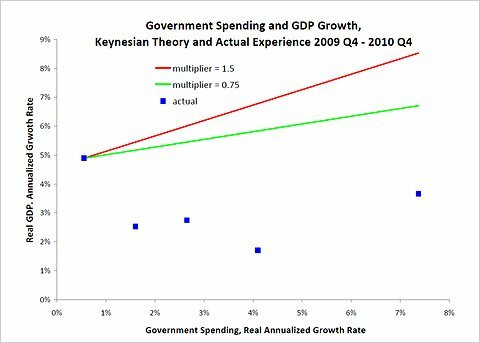 Regardless of whether you agree with the Keynesian assumptions, the facts fail to confirm their emphasis on consumer spending as a driver of the economy. When the latest recession got under way, hiring fell much more than consumer spending. More recently, we have seen real consumer spending reach all-time highs, while employment remains lower than it was 10 years ago. All of this is consistent with my view that consumer spending reacted to a bad labor market and rejects the assertion that a consumer spending recovery would bring back the labor market. Public policy needs to help cure the labor market disease, not merely treat the consumer sector symptoms. 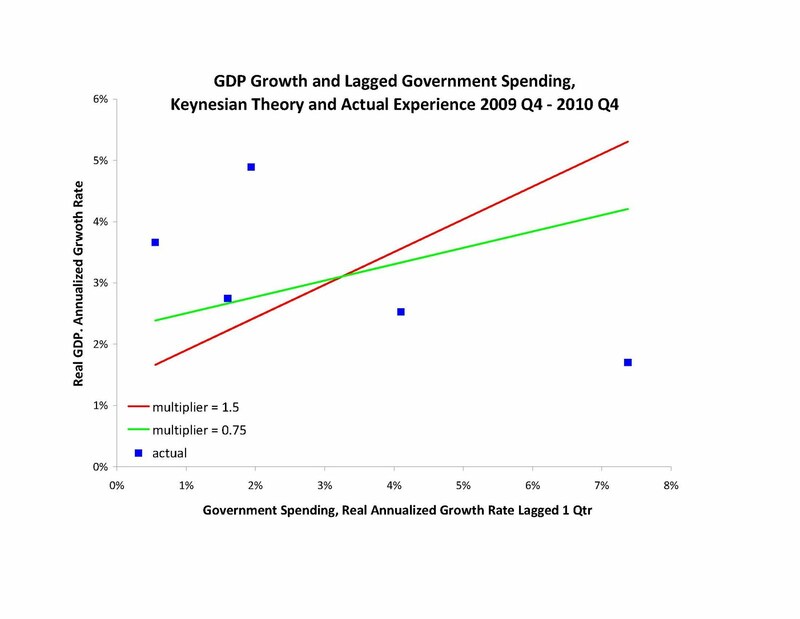 Do Government Spending Cuts Reduce Growth? We can test this proposition using the stimulus wind-down over the past couple of quarters. The blue squares in the chart below are measures of actual inflation-adjusted government spending growth and real GDP growth. It looks like the economy grew more as government spending was cut after the stimulus peaked. (For an explanation of the red and green hypotheticals shown in the chart, click here). 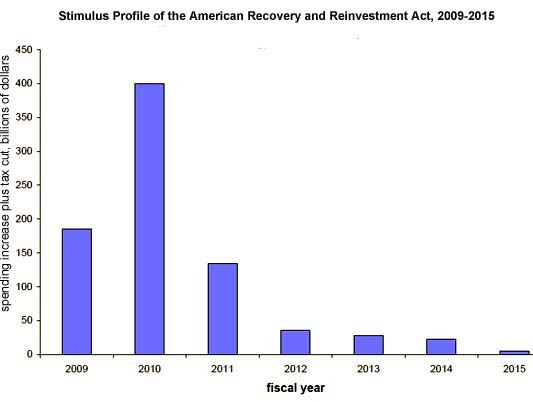 the wind-down of the ARRA "stimulus" was set two years ago when the law was passed. By what miracle did the stimulus designers get the timing exactly correct, while at the same time were wildly off on how deep the recession would ultimately prove to be? If you believe that government spending really does increase GDP, what exactly is helped the economy endure the end-of-stimulus spending cuts by actually growing faster that it did a year ago when stimulus spending was peaking? 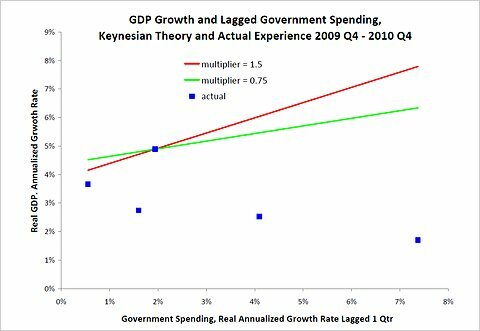 If the advisers were right, economic growth should have increased further when government spending grew still faster in the next couple of quarters, and then economic growth should have been less as government spending grew more slowly later in 2010. 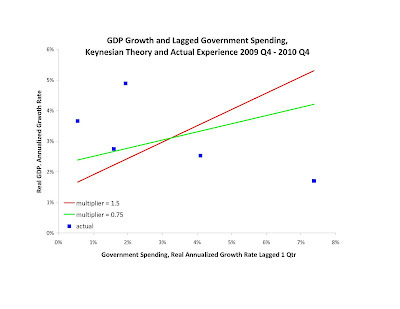 Tomorrow I will post an article about government spending and GDP growth during 2010. 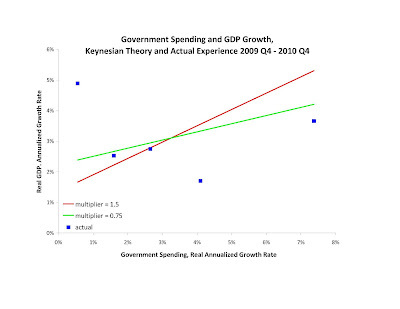 That article has two charts showing Keynesian projections for economic growth, using 2009 Q4 growth as a benchmark. The article briefly notes that the benchmark doesn't really matter for the conclusion, because the data show a clear negative correlation between government spending growth and GDP growth. 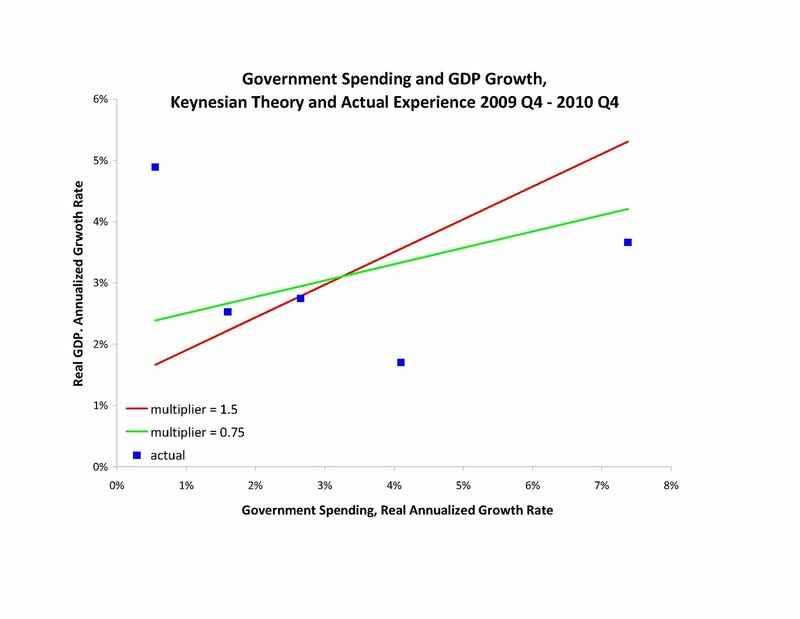 But the charts below help show more vividly that the benchmark does not matter, by using an alternate normalization -- the average government spending and GDP growth during the period shown. All of this will make more sense when the original article is posted Wed March 2.